Sarj has provided several great photos here and this is one of the man himself. That's him in whites hiding behind that camera. 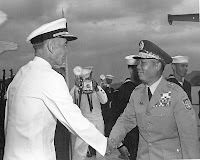 This was his first photo assignment at TDC, probably early in 1962, and he believes it was taken aboard the USS Oklahoma City and that the officer was probably Vice Admiral William A. Schoech, Commander of the US 7th Fleet.